Editor's note: This article contains spoilers for the game Silent Hill 2. He is silent, has no storyline of his own and although he engages in horrifying acts, we eventually discover he lacks his own motivation. The player never has to directly attack him. We never see his face or really hear his voice, though he possesses an intimidating form and flashes of tortured personality throughout. Because of this, he is one of gaming's most memorable recent antagonists. Relentless and strong, unable to be defeated, assailant and judge in one, Pyramid Head is a very atypical bad guy. In the Making of Silent Hill 2, Art Director Masahi Tsuboyama describes the game's interiors as intending to both repulse and simultaneously draw the player in with a certain mysterious aura - which is Pyramid Head in a nutshell. He's repellent and alluring, a frightening contradiction that begs the question of why we're so fascinated by such a creature. The first glimpse of him is haunting: standing completely still, facing the character James through the gate separating them, helmet lowered, with a faint red glow about him. After a while, James enters an apartment and immediately sees Pyramid Head pinning down two Mannequins; enemies comprised solely of a female torso and legs atop another. James is scared and repulsed. After he hides in a closet, James watches as the creature pries apart his victims' thrashing legs, in a form of sexualized violence. The Mannequins shriek in pain as he kills then drags them along the floor behind him. Later, before James battles Pyramid Head in a hallway, he similarly attacks and kills another female creature. In Silent Hill 2, Pyramid Head is the only truly overtly masculine enemy, as well as a violent, sexualized one. He doesn't make any sounds, aside from what seem to be moans of pain. At times, he grabs at his helmet, as if he were suffering. His Great Knife, which is extremely powerful, is also particularly burdensome. 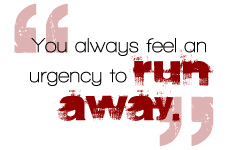 He must drag it behind him, moving slowly with its weight, and yet you always feel an urgency to run away.